No, it’s nothing to do with pest control. It is thought that the rhyme originated in the late 19th or early 20th century. This was a time of great poverty in England. One way the people could obtain money was to pawn their possessions. This was known as to hock or pop. At these times people would be forced to pawn essential items such as their bedding, furniture and clothing. But on the whole they would try to pop only items they could do without, such as their wedding rings. One such item was their weasel iron. The women would only use their iron on a Tuesday after the Monday wash. They would then pop the weasel iron on the Wednesday. With the money they received, they would buy half a pound of tuppeny rice and half a pound of treacle. This type of food was both starchy and filling. 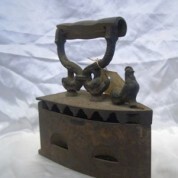 They would then take the iron out of pop on a Friday when their husbands received their pay. The word weasel comes from the wheezing sound the charcoal made inside the iron. This iron (MSC84) was lent to Russell Museum by Nigel Armitage and David McGill.